We had a big Nemo bash for Hannah in May. Suddenly now, she's three! I'll have a post all about our girl soon. I didn't blog much about Hannah at two. For all the difficulty that her first year of life brought to us in parenthood, she has blessed us with a fun and easy toddler stage for which we are forever grateful. I could go on and on about how wonderful she is, but I'll stay on task about the party details and share about Hannah in another post. So Hannah's party was about a month before the release of "Finding Dory". 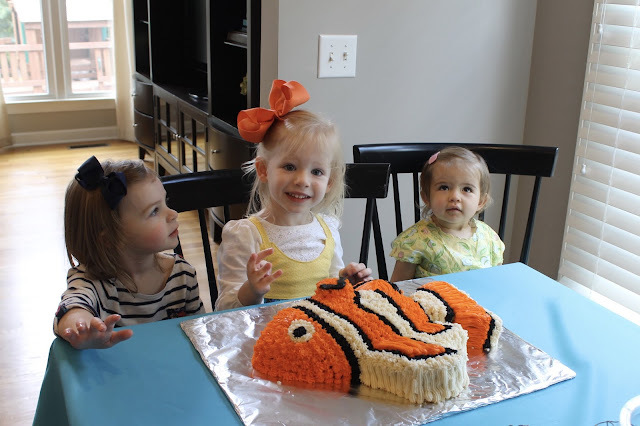 She chose the Nemo theme a couple months before with no clue about the upcoming movie release. 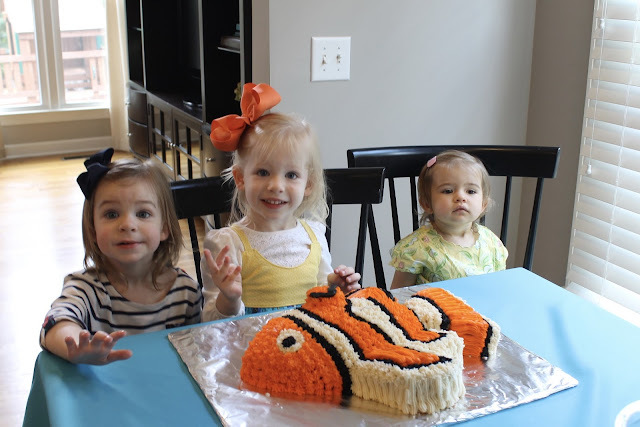 I'll admit I was pretty excited to do a Nemo theme. There are just so many scenes you can pull from for decorating ideas, and I loved how colorful it could be. We'll have plenty of pink birthday parties in our future. Plus I knew I would be able to more easily find party items with the new movie release. We were still a few weeks early before the motherload of Dory things hit the shelves. So we were able to get a little creative too which I love. For the front door, I made this wreath from tulle ribbon. 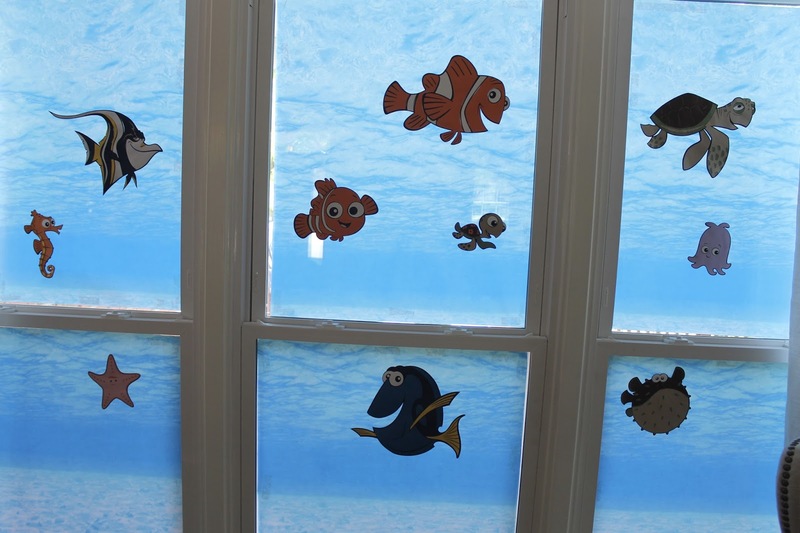 Once inside, we did a big ocean mural across our living room windows. I used my cricut again this year to make the characters. I plan on putting them in an album with pictures from her party like I did last year. She loves looking at her Pooh album to remember her 2 year party. I completely lucked out on the water background. It is bulletin board paper in an ocean scene. I was walking around the aisles at hobby lobby looking for anything that would work. I was thinking of using transparent blue gift wrap when I happened upon this. It only took one roll, and I had my coupon. Score! Mom win. We added some characters to the family room mantle too. 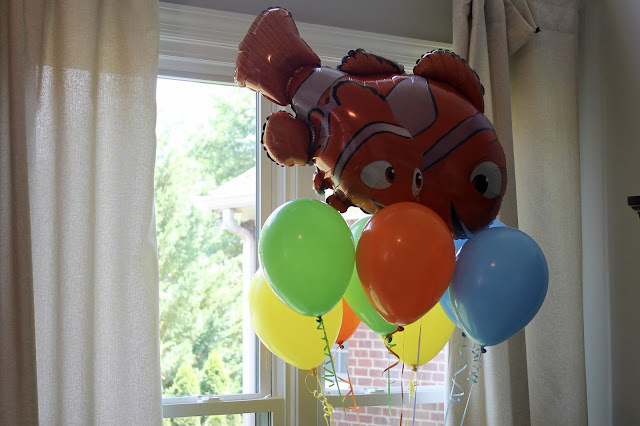 When asked what she wanted at her birthday, Hannah's one request was a Nemo balloon. So I bought this overpriced one off amazon that lasted a day. Nemo and Dory balloons weren't at the grocery yet in May. Now they're all over the place. Oh well, she still loved it. For centerpieces in the kitchen and dining room, I found cheap, plastic fishbowls off Amazon. I filled them with nerds and put Nemo bath toys inside. The rock candy was supposed to look like aquarium coral. The fish net was a big sheet I bought off Amazon as well, and I cut it up to use in different areas. I made these jellyfish for over the kitchen table. I didn't put the center wire in them so they wouldn't be as perfectly round. I hung them with teeny, tiny clear command hooks. I loved those things. They were so easy and stayed put. I also added the goggles with the address that helped lead Marlin and Dory back to Nemo. For the food, we had croissant deli meat sandwiches made to look like crabs. I got the idea to buy different colored napkins and arranged it look like clown fish stripes. As a healthier option to the croissants, we had lettuce wraps. Our spinach artichoke dip (seaweed dip) was still in the oven. I made the cake from a football pan and freeformed cut all the fins. They don't make fish pans...trust me I've looked. I used sharpie pens to decorate this pot out on our patio. It was kind of a chilly day, so no one ended up eating out here. We still have it out on our deck, and the flowers are huge two months later! This mini bouncy house was our gift to Hannah. The cost to rent a big bouncy house was comparable to purchasing this one. We knew we only would have a few little ones to jump and went for this instead. We still blow it up and play in it about once a week. It only takes about two minutes to inflate and comes in a nice storage bag. We love it! We found this Dory bowling set at the dollar store. The girls loved playing it. I love everything about this picture of her blowing out her candle with Grandma and some of her best buds. We opened so many thoughtful and wonderful gifts. I completely failed at getting pictures with all our family and friends, but this is a sweet one with Hannah's Nunu. Most of the party favors were from the store 5Below. Everything there is under $5 in case the name wasn't obvious. ;) We gave Hannah's guests a coloring book, sidewalk chalk, fruit snacks, and pez dispenser. This was a picture at 5below when we were shopping for our favors. haha. Oh this girl is so loved, and I hope that her Nemo party lived up to all she had dreamed. She is as sweet as can be. 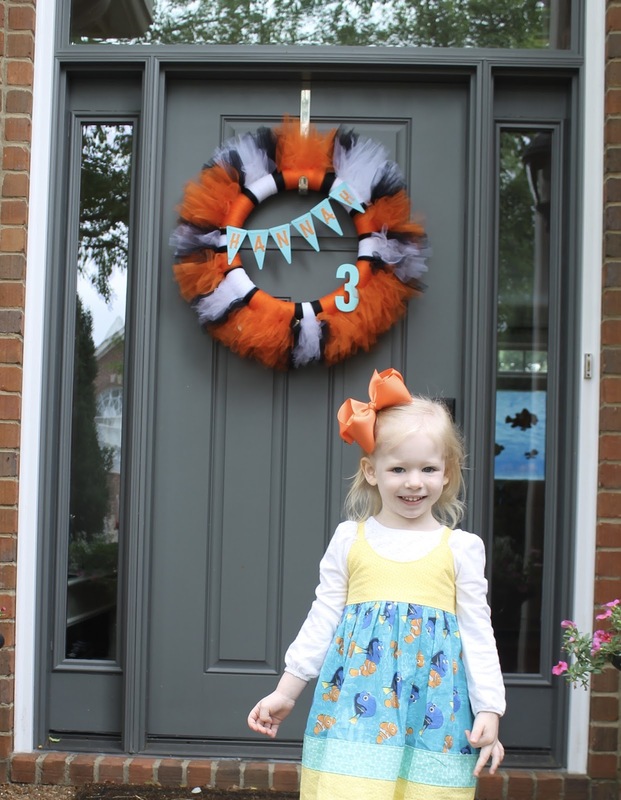 Happy 3rd Birthday, Hannah! Hello! My name is Mary Beth, and I live with my wonderful husband of 5 years, Weston, in Birmingham, AL. I love the south and my front porch lemonades. This blog is an outlet for me to share my projects, ideas, and life! Thanks for stopping by.